This next post is a guest post of sorts. 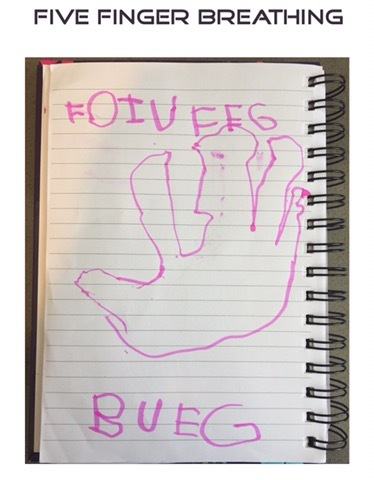 It is “co-written” by my daughter Elsie (6 years old) and me. Elsie is often curious about what it means exactly, when I say I’m blogging, and because she has some ideas to share, I thought I would show her a bit about what it means to blog! Feel free to leave her feedback on her shared strategies in the comments. 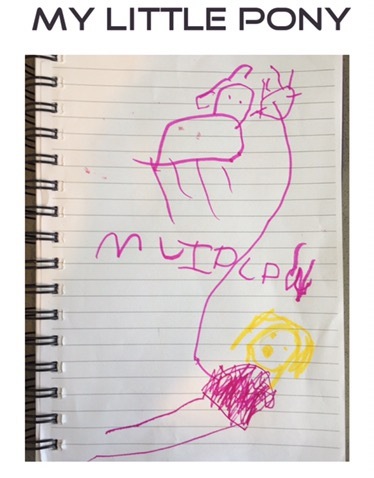 Having a mom who is very interested in the workings of the brain and mental health, means that my daughter Elsie, by default, has also learned a lot about the brain and how it works. Most of her early understanding of the brain focuses on the amygdala (which she and my students refer to as the little brain), and the prefrontal cortex (which we call the big brain). At her age this covers enough for her to begin to understand self-regulation and what is happening in the brain when we are dysregulated or anxious. Sounds too complicated for wee ones to understand, but trust me, they get it. Read more about how I teach kids about the brain here. Some of you may have read a prior post that shared about a difficult time that Elsie experienced in the fall with having a lot of anxiety and worry. This difficult time encouraged us to work even more with her to develop relaxation and coping strategies. I also like to think that she potentially bounced back as quickly as she did from this, because of the conversations we had had, and the things we had practiced beforehand, but who knows. 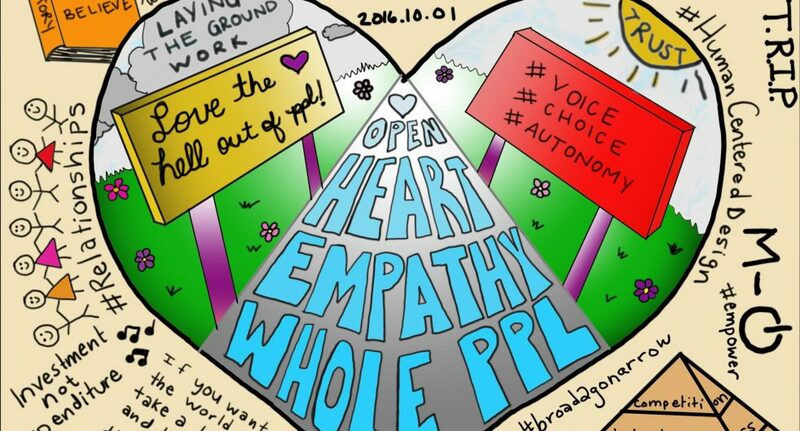 We also picked up some other great strategies during and after this challenging time that helped her immensely, and that we continue to use even now that things are going better. For the following part of this post I am going to hand over to Elsie. It will focus on her sharing some of the strategies she has drawn in her “strategy book.” Some of these she has come up with on her own, while others she has chosen from books or elsewhere, as strategies that are helpful to her. 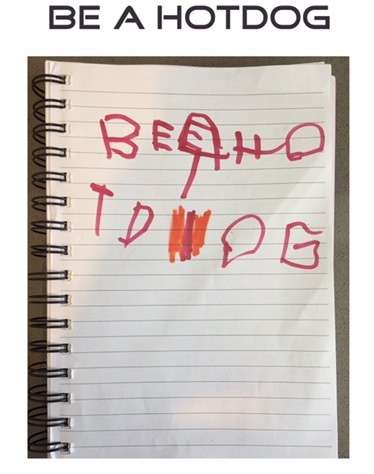 She has added them to her personal “strategy book.” The idea is not that these ideas will necessarily work well for all kids, but rather to show teachers, parents, and kids that we can start exploring these strategies at any age, and that it can be helpful to start building a toolbox of strategies at a young age. Let’s take a look! 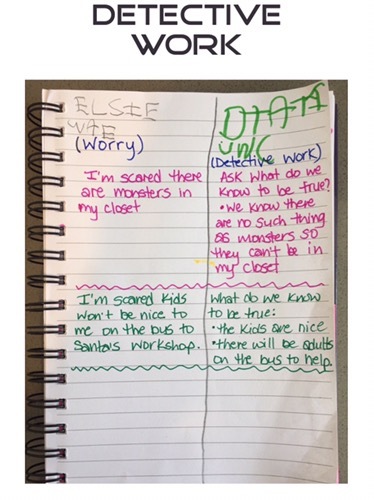 Detective Work is a strategy that I learned from a “worry specialist.” When I am worried about something, I tell mommy and daddy and they write my worry down in my book (left column). After, we do “detective work” on the other side of the page (right column). Mommy or daddy ask me “What do we know to be true?” so that I can see if it is really something I need to worry about. See the examples in the picture above. Message from Mommy: This has by far been the most powerful strategy in reducing Elsie’s anxiety and worries. It allows her to look at the facts and realize that most times there is nothing to really worry about. For example: Do monsters even exist? No! So do I need to worry that they might be in my closet? Of course not! This strategy has become second nature, and often we just have a discussion about it and don’t need to write it in the book. Most often, Elsie now does the detective work herself, in her head. If it is a reoccurring worry, we add it to the book so that we can go back and read the detective work if the worry comes back. Five Finger Breathing can be done anywhere and is really easy. You breathe in through your nose, as you trace up your fingers, and then breathe out through your mouth, as you trace down. Watch me in the video below. The strategy pictured above is called Be a Hot Dog. I think I got this idea from GoNoodle. I like using this strategy to relax at bedtime. First, lie straight on your bed like a hotdog and tighten all of the muscles in your body. Stay tight like this for a few seconds, then slowly relax all of your muscles and roll up into your blanket like a hotdog bun and drift off to sleep! It feels really cool! My next strategy is The My Little Pony, but it can be done with any soft toy. I use my My Little Ponies or my Trolls because they both have soft hair. You can do this anywhere where you are allowed to have these toys out. It is very easy. I lie down and play with the hair of my pony or troll. It feels soft and relaxing and helps to calm me down. 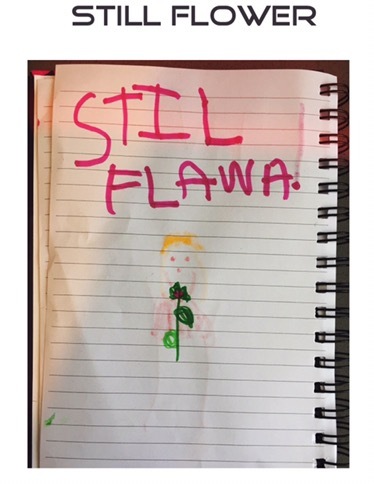 This next strategy is called Still Flower. I got this idea from GoNoodle’s Melting. It’s really easy. You just lie still as a flower. Sometimes I close my eyes. The Crocodile is a special way to breathe, and a pose. See my drawing and the picture from the book. I lie down on my tummy like a crocodile and rest my chin on my hands. I take a deep breath in through my nose, and then let the air out through my mouth. The Frog is another pose that I like because you can jump high. I crouch down like a frog and hop up and then back down. Woodchopper Breathing is good when you are frustrated or angry. 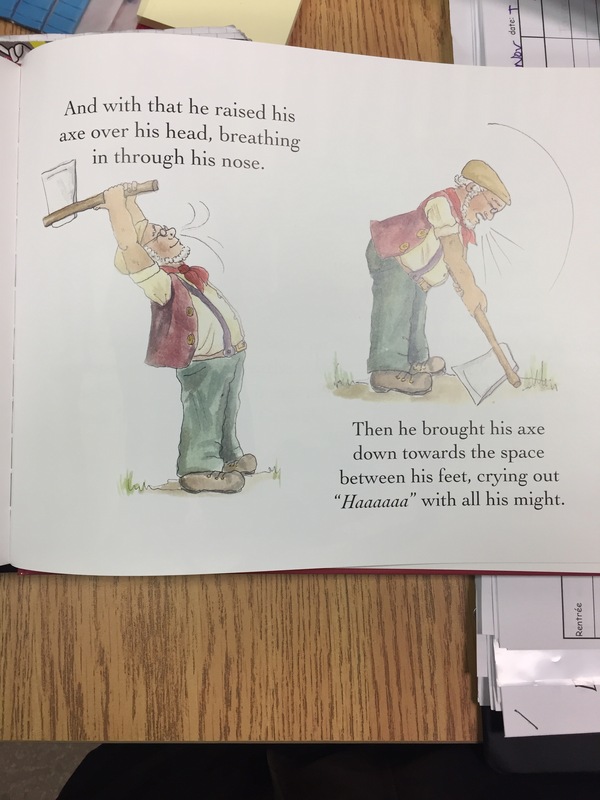 I pretend I am holding an axe and bring it up over my head as I breath in through my nose, and then swing it down to chop the wood, as I let the air out with a loud sigh. I keep doing this until I don’t feel mad anymore.